I am so excited to be linking up with my friend Celeste at The Education Highway. 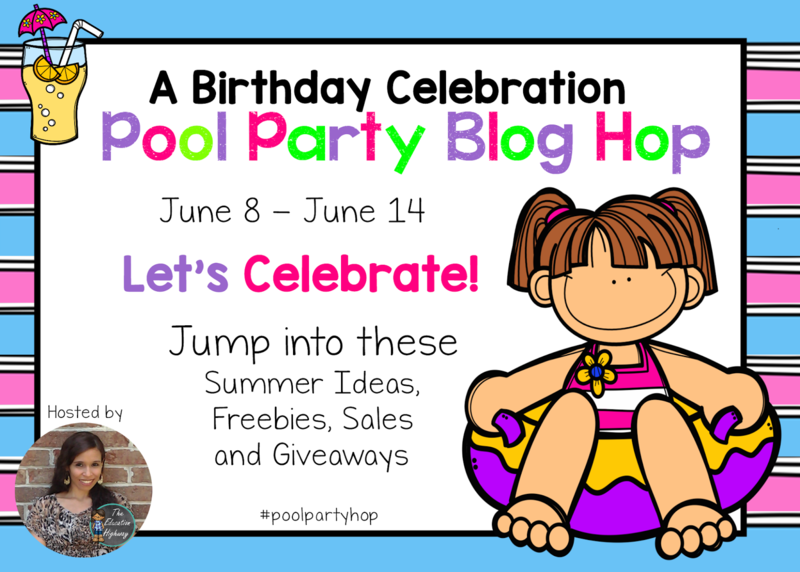 Who wouldn't want to celebrate their birthday with a Pool Party Blog Hop? So many summer ideas, freebie, and of course, GIVEAWAYS. When I think of summer, I think of yummy, yummy watermelon! First up, we made these adorable paper plate watermelons. I found the bright pink and green paint at Wal-Mart. We added the black buttons with Elmer's glue. Then, we wrote about eating watermelon. This second craft was Pinspired. You can find the originaal pin HERE. We made this adorable watermelon with shaving cream, Elmer's Glue, and the same paint from above. I dis not measure out the puffy paint, but I would say it is about 2/3 shaving cream and 1/3 glue. Then I added a few squirts if paint until I got the color I wanted. If the paint does not look puffy enough, simply add more shaving cream.We stuck felt seeds on before it dried. Then, we wrote our math number problems. Felt is cheaper then buttons, but I think I like the look of the buttons better. You can get the templates I made FREE HERE. Looking for more FREE Ideas? 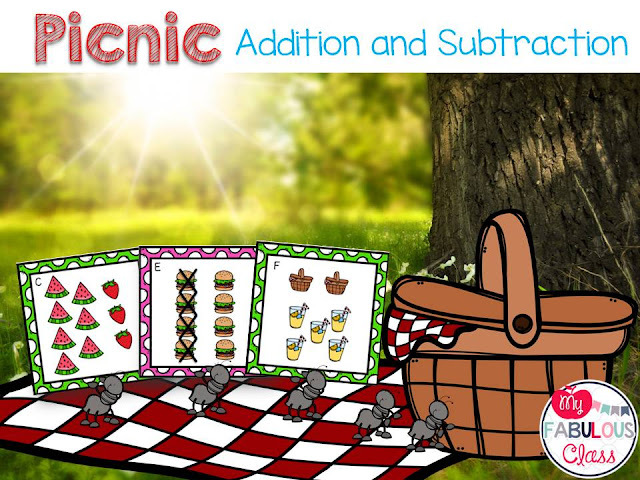 Check out my Picnic Addition and Subtraction Centers. Want more? I put ALL of my SUMMER THEMED PRODUCTS on SALE for 20% off until Thursday. You can see everything on sale by clicking HERE . 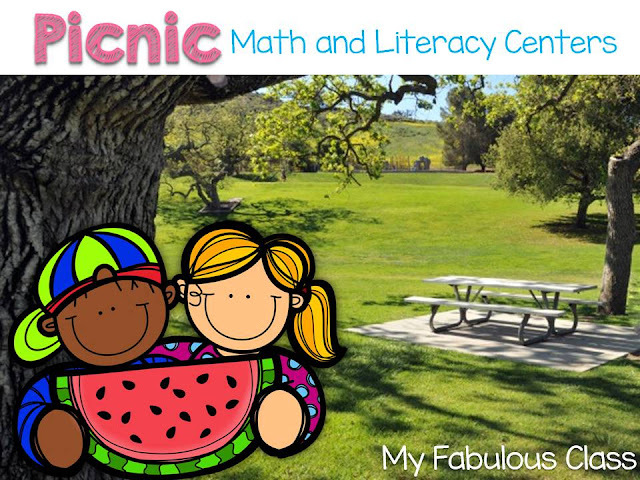 My Math and Literacy Picnic Centers would be a perfect addition to these activities.There are 7 math games and 5 literacy games included in this pack. Click on the picture below to see who is celebrating with us. This little E-book tells you which of your favorite teacher bloggers are participating and what they are giving away. I am in Giveaway 1 and I am offering a $10 credit to my store. Click on the link below to see all the teacher that have joined the party. Hop through to see lots of summer ideas and, of course, FREEBIES! I like Rain MAn. I love autism stories. Thank you joining my birthday hop! What a cute picnic freebie, I am looking forward to trying it out with my little ones.